The use of mHealth apps have grown exponentially in the past few years. From monitoring of health conditions to diagnosis, mHealth apps offer remarkable opportunities to improve our health, safety and preparedness to common illnesses. According to a report, there are 3, 25,000 healthcare apps available worldwide with Android mHealth apps leading the way. Another survey from Accenture indicates that the download of mHealth apps has doubled in the past few years. All these statistics prove that the healthcare industry is in the race to gain mobile technology advantage. If you too are planning to build your own healthcare app, then it is important to understand the types of mHealth apps and the steps involved in the process. So, let’s take a look at the types of healthcare apps first. They can further be divided into the following categories. With the help of these apps, doctors can keep all the information regarding drugs, diseases and prescriptions in one place. Epocrates, Medscape, VisualDX are all examples of Medical reference & database apps. These apps provide social networking platforms to healthcare providers and professionals, where they can interact, connect, exchange knowledge, and grow a professional community. ‘Among Doctors’ and ‘Daily Rounds’ are the two examples of such apps. With the help of these applications doctors are able to monitor the health of patients during the medical treatment process. An example of such apps is – VitalHub Chart. These applications serve as an integrated platform that help patients to get convenient access to healthcare from anywhere in the world by connecting them with the experienced doctors. They also help to reduce the handwritten work of keeping journals. ‘Zocdoc’ is an example of such apps. These apps help users get assistance from doctors within minutes. These apps also help in online doctor visits and consultations. For Example: KRY. Patient medical education apps (patient portals) – Such apps give patients 24/7 access to personal health information from anywhere. These apps mainly include informative text materials and video tutorials. Healthy lifestyle apps – These apps include – fitness, cardio apps, wellness apps etc. Mental health apps – These apps are designed for stress relief meditation, sleep tracking etc. Dieting apps – These apps let users help with exercises, diet and weight loss. This feature allows sharing of documents and lab test results, which connects patients and departments faster. This allows patients to schedule, postpone or cancel appointments with doctors right in their mobile app. This feature is useful for the people who don’t have time to see their doctor in person. This feature reminds patients about their appointments with doctors and medicine intakes. A one-click option, this feature allows the patients to get in touch with the healthcare providers in case of emergencies. This feature integrates payment gateway with the mHealth apps. It is very important to understand the value your app will provide to the end-users. Find out the specific needs of your users and design your app in such a way that it meets their expectations. There are millions of app available in the Appstore and Google Play store. Standing up to so much competition and creating a profitable app can be challenging. So, when developing a mHealth app, make sure your idea is unique. Your idea might already exist in some form in the Appstore but you can offer a fun spin to it. Also, give your app stunning graphics and beautiful layout that sets it apart from other similar apps. The more uniqueness it can offer; the better. A simplified, easy-to-use interface is very important to make users like your app. People download apps to simplify their life in some way. So, it is not a good idea to make an app that makes them work more. Easy menu navigation and catchy user-friendly interface are the two other features that make the user experience much better. Testing your application is very important for its smooth functioning. Don’t ignore the ratings and feedback of your app as they provide an opportunity to improve your app. Your application has to be responsive and should be flexible for updates. When dealing with consumers’ sensitive information and managing protected health information (PHI), it is important that your app meets privacy policies and government regulations, for example, FDA or HIPPA. Most of the mHealth apps are published on iOS and Android platforms. To know which platform would be the best for your app, it is important to investigate your market. You can even involve multi-platform app development for your future apps once your app is successful. Just like any other business, it is important to have a strong strategy for your application too. In this age of smartphones, applications are preferred over mobile sites. 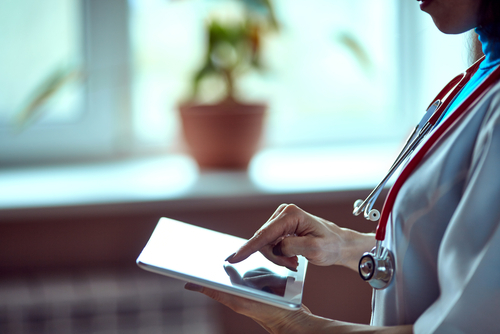 So while, it is important for healthcare organizations to have a website that’s optimized for mobile devices, a good application can make their customer experience even better. Payal is a Content Consultant at Enuke Software, a pioneering Blockchain and healthcare App Development Company in the USA. Payal is passionate about the start-up ecosystem, Crypto world, entrepreneurship, latest tech innovations, and all that makes this digital world.